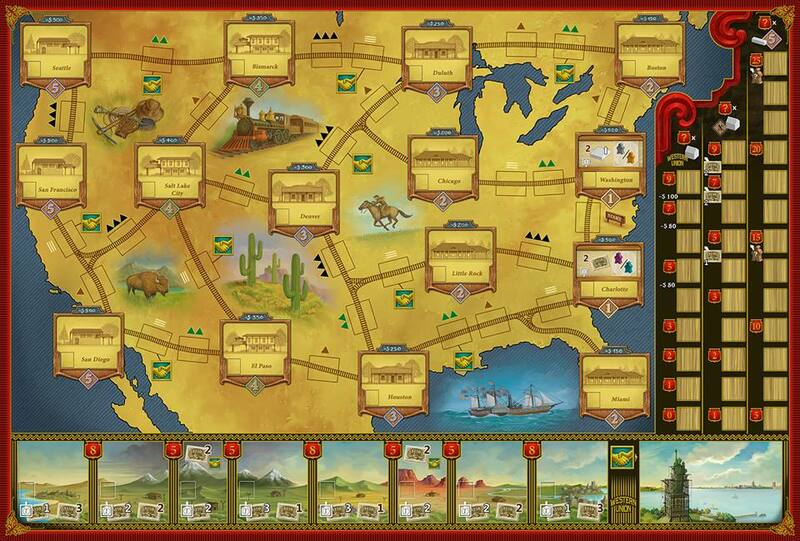 Railroad Revolution, a game about the expanding railroad lines in the United States, puts the players in the shoes of people like Cornelius Vanderbilt and James Hill. To become the Vanderbilt of the cardboard United States you must use your resources wisely to build the most efficient line. What is Railroad Revolution like? Railroad Revolution, is a worker placement game, plain and simple, but to leave it with such a basic description would be a disservice to the intricacies of the game that truly make it interesting. As in most worker placement games, each player has their own workers that they can place on different spots to enable the completion of certain actions. On a player’s turn they take one of the workers not already on their player board, and places it in one of four areas; building rail, building train station, building telegraph stations and selling rail/stations. The interesting choice comes in what type of worker you send. There are five different types of workers and each will give you a different advantage based on the action you select. Sometimes the workers will allow you to do things cheaper, other times they help you do more than normal. Having the right coloured worker do the right action, at the right time can be the difference between winning and losing the game. Throughout the game you are doing the actions mentioned above keeping different goals in mind. Scoring opportunities abound and different strategies can result in a win, but keeping an eye on your opponents and ensuring their path is obstructed is necessary. Whenever you build train or telegraph stations you get different bonuses and the first person to do so gets a better bonus than everyone else. One of the most interesting things in the game, in my opinion are the “Deal” cards. They are triggered when telegraph stations or rails are placed in specific locations. Whoever triggers the deal gets the chance of completing one or both of the deals, but the opponents also get a chance to complete one of the two. You trade in stock to complete the deals and gain a reward. The timing on these deals and having enough stock when they are triggered is a huge part of the game. To win the game you need the most points and there are many ways to earn points in this game. You can gain points by advancing one of three different performance tracks giving points for your total number of train stations, telegraph stations and the total number of west coast cities reached. The higher you go on each track the higher the multiplier is for each of those accomplishments. Milestones are another big scoring opportunity and give you goals to achieve throughout the game in exchange for points at the end of the game. The more you complete the harder they get, but their value increases dramatically. Building telegraph stations neighbouring each other gives you points as well. The final way to gain points is by obtaining train tiles and having them unused (each train tile can be used for a bonus, but must be refreshed to score as points). 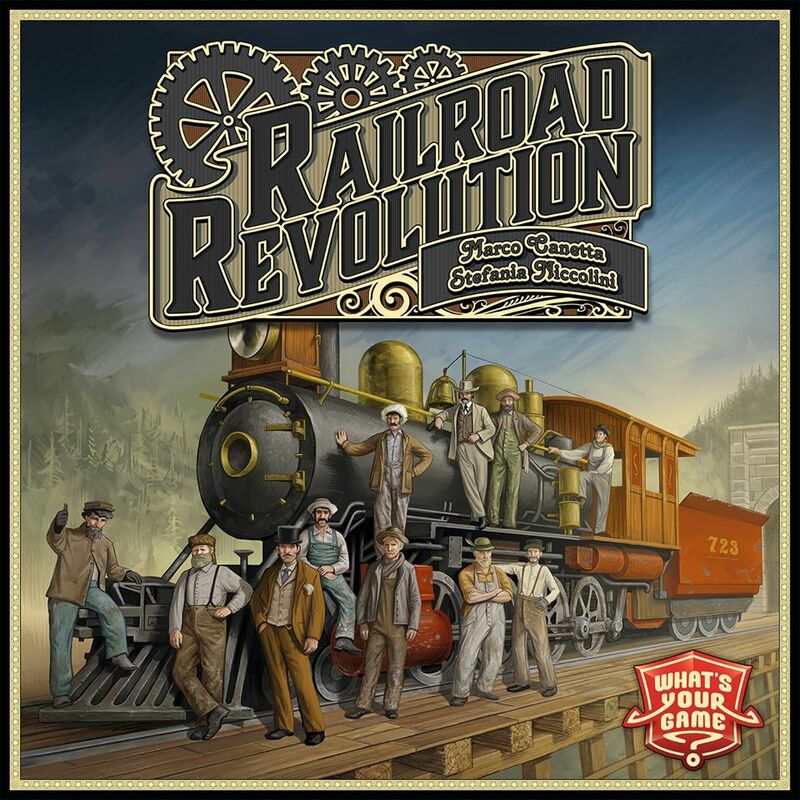 Railroad Revolution is a very good game, but it is definitely a game that will cause a lot of people to spend a good amount of time thinking before each turn. Even though there are only four different actions, since you could have five different types of workers, the possibilities are drastically increased causing some to get overwhelmed. Even though a lot of games of this style are typically not super thematic, I think Railroad Revolution does a great job integrating the theme. Each specialized worker does a specific thing better than the others. If you hired an accountant they are hopefully going to help you financially, but if needed they could also do the work of the regular employee. Every action you take, when you think about it, shows what expanding the rail and telegraph lines was all about. It was a race to have the biggest stranglehold on the business as possible and Railroad Revolution makes you feel like you are in that race. What I love the most about this game, though, is the tightrope you have to walk on every turn. You have to make sure you have the right workers to give you the best action possible, while also making sure you have enough money and keeping a few stocks in case a deal is triggered on someone else’s turn. There is so much that you want to do, but each turn you can only do one thing. The tension that causes leads to a feeling of triumph when you plan out several turns in advance and every part of those plans come to fruition. Railroad Revolution is a deep game. Each turn isn’t a difficult decision, though there are several options, but you have to plan multiple turns in advance in order to succeed and that can be difficult for many people. Marco Canetta, Mariano Iannelli, Railroad Revolution, Stefania Niccolini, What's Your Game?